The IKMP, information and knowledge management program of the land commission considered about the land cover map in the in the lower Mekong Basin Which the information for map creation is not up-to-date and information . 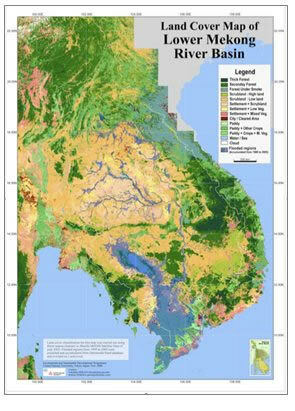 Alack of essential up-to-date data and information in the Lower Mekong Basin(LMB) is one of The major constrains for environmental study or research, water resources planning and the management of floodplains, including for GIS analysis and modeling purposes and hydrological and climate change study and assessment for Mekong River Basin(MRC2012). There fore, we hope that the Land Cover data and information may useful for all of users. To collect, compile and provide accurate and reliable land cover information and the covering types within the Mekong River Basin in Thailand in order to support the interpretation of land cover information from the satellite imagery, conduct reliable accuracy assessment and establishment of the land cover information catalogue for Thailand. The Thai Nation Mekong Committee Secretariat (TNMC) has main organization, Land Development Department for total target areas of field survey implementation. The plays a critical role in facilitating implementation of the Land Cover Project and commitment and involvement of line agencies in field survey implementation . The TNMC plays a critical role in the facilitating implementation of the Land Cover Project and acts as a catalyst and facilitator of the commitment and involvement of line agencies in field survey. The TNMC provides technical and administrative support to Land Development Department. The target areas of Land Cover Field Data collection and Land Cover Production of the LMB comprise 164 target areas which cover 24 provinces of Thailand the total target areas have already done since December 2012.